Last year, Danielle James received yet another eye-roll inducing message in her OkCupid inbox. This one read, “why you not want kids for?” Although it wasn’t the most offensive note she had been sent in the weeks since reinstating her dating profiles, the clumsy inquiry stuck with her as she walked into Glas, the neon shop where she was apprenticing under the guidance of veteran-bender, Nate Sheaffer. 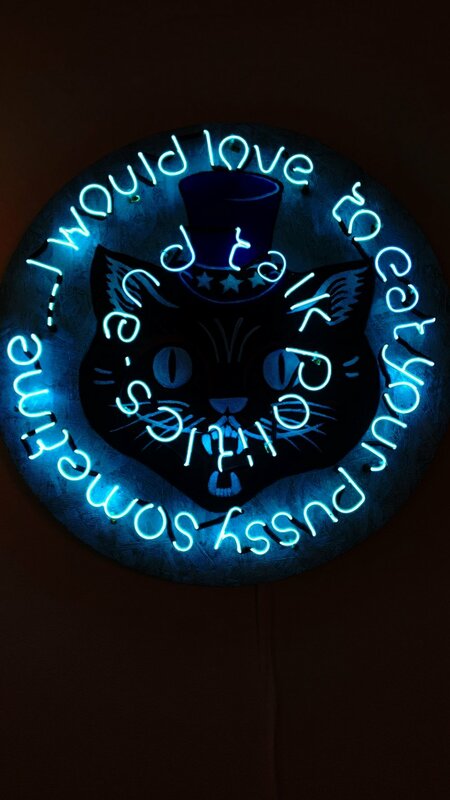 She told Sheaffer about the unsolicited message while the two were fabricating commissions in the shop, in the weeks since she had opened her dating profiles, these neon bending sessions had become a time to voice her frustrations with contemporary dating-culture. She told Sheaffer she wanted to do something with these ridiculous messages, and he encouraged her. That “something” turned into Danielle’s witty and relatable series, Signs of the Times: A Single Lady’s Life in Neon. Signs of the Times, became the a creative outlet for Danielle to both vent her frustrations with a humorous twist and practice various bending techniques. Each piece is a visual interpretation of a notable message and a study of new fonts, shapes and styles. “My life was imitating my art, or vise-versa,” Danielle adds. Danielle calls herself a “baby-bender”with a year and a half experience in the industry. 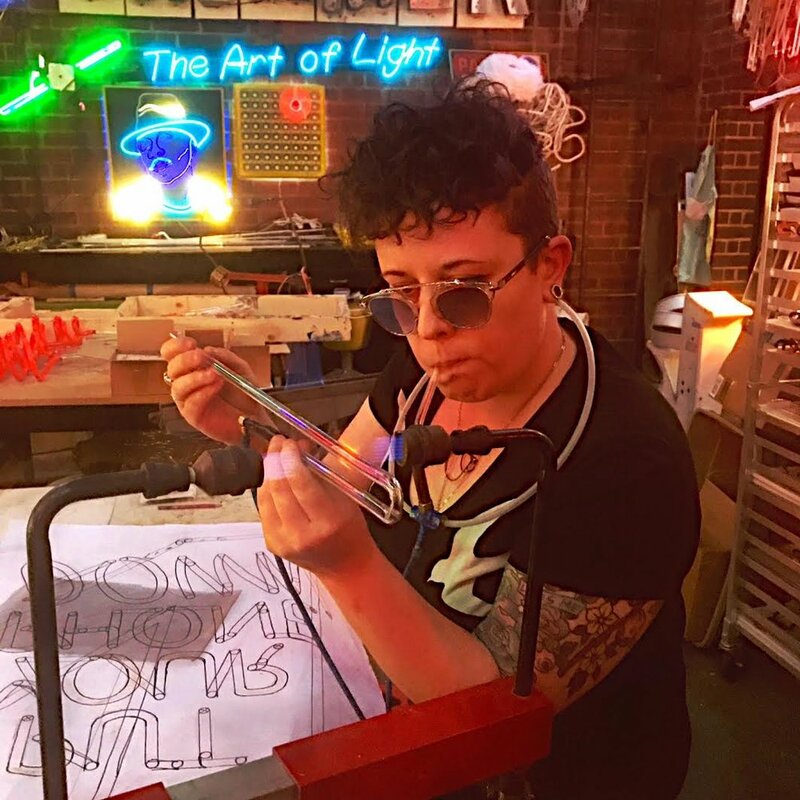 She initially approached neon as an added element to her jewelry-making, Danielle holds degrees in jewelry and metalsmithing, and quickly became fascinated with the process of creating one-of-a-kind neon pieces. She was fortunate to connect with Sheaffer who is invested in the education of neon as a way of keeping the medium alive. Now, no longer single, Danielle has removed herself from dating apps. Although, she no longer receives digital inspiration for her Signs of the Times series, she plans on expanding it to include messages received by men. In doing so, she hopes to keep the series from being one-side and encourage a more in-depth dialogue about dating and gender culture. 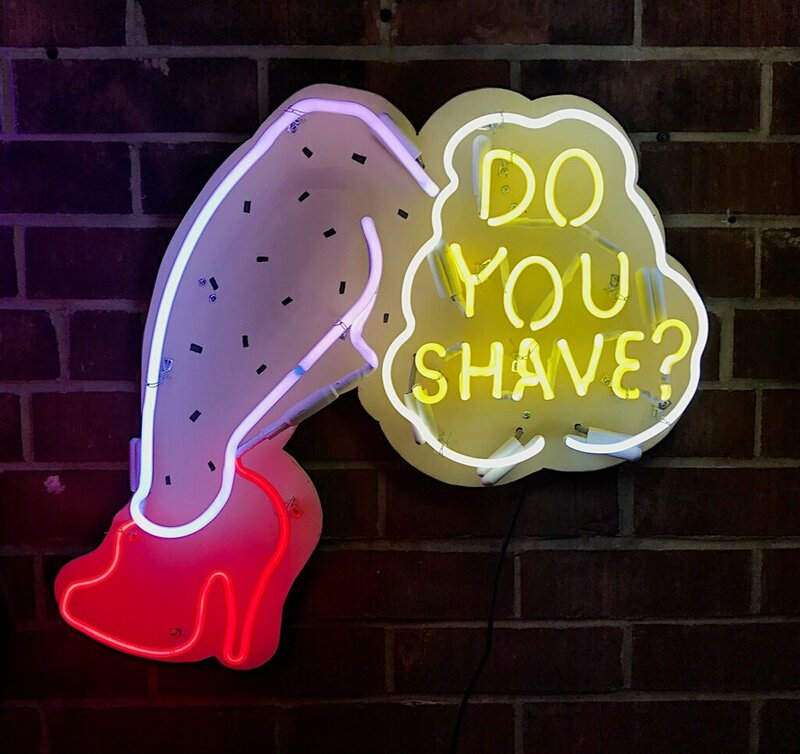 A selection of signs from Danielle James’ Signs of the Times series is currently on view at The Midway Gallery as part of SHE BENDS: Women in Neon. You can see her work, and that of 31 additional female benders during our gallery hours Wednesday to Saturday from 2pm to 7pm.